Stella MSG file to EML converter software is helps to Impart MSG file into EML/EMLX with it attachments like as:- body content/image header and attachments. This MSG to EML converter tool that is safely export MSG file into working EML/EMLX format with its Emails properties as:- to/bcc/cc/subject and date. MSG file to EML/EMLX conversion program is original utility to extract MSG file into EML/EMLX without any corruption in your database this software also gives you demo feature at free of cost with its demo you can restore 5 MSG emails into working EML format with its whole data. 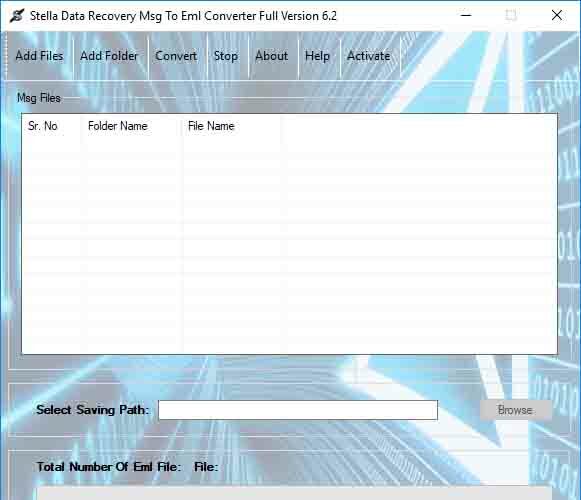 Stella Data Recovery MSG file to EML converter tool carefully transfer MSG emails into well manner of EML/EMLX format. This program easily install on whole version of windows Win2000,Win7 x32,Win7 x64,Win98,WinServer,WinVista,WinVista x64,WinXP,win8,win8.1,win10. MSG to EML converter program that has lots of feature to export outlook MSG file to EML/EMLX. Recent Changes: Stella MSG file to EML converter tool provides you easy way to convert MSG file into MSG file data. Gasketed Plate Heat Exchanger Design 7.0.0.0: Thermal analysis and calculations for gasketed plate heat exchangers, Easy 2 use One Simple Image Compressor 1.0.0: Compress large image files to smaller size, batch process your bmp, jpg, jpeg... Process Engineering Calculator 2.0.0: A set of 25 popular process engineering calculations grouped into one software One simple image watermark 20.14.0.0: watermark your images, batch watermark images. Overlay several images.